Masih’s ordeal is just one example of Pakistan’s recent use of its stringent blasphemy laws (see “Searching for me with pistols and daggers,” p. 31). Despite increasing protests and campaigns for reform by Christians around the world, the situation for Pakistani Christians under this law has worsened since the 1990s. In 2010 brothers Rashid and Sajid Emmanuel were shot outside a court in Faisalabad following a blasphemy-related trial. And accused prisoners Robert Danish and Qamar David were found dead in prison in 2009 and 2011. The police claimed that Danish hanged himself and David died of cardiac arrest, but relatives and Christian rights groups maintained they were killed unlawfully while in custody. Asia Bibi, a farmhand and a Christian mother of five, was imprisoned in a high-security prison after being accused of blasphemy in 2009. She took a drink of water from a glass belonging to her Muslim colleagues, rendering it “impure.” In 2013 Bibi was moved from one prison to another amid mounting concerns that she might be killed in prison—following an alleged attempt by one prison warden to do just that. Christianity was introduced into Pakistan (then part of British-controlled India) in the late nineteenth century. Indian Christians (who multiplied from around 3,000 in the 1880s to 37,000 by 1900) were largely from lower castes. When Pakistan was portioned from largely Hindu India in 1947 as a homeland for Muslims, its founder Muhammad Ali Jinnah said, “You are free; you are free to go to your temples; you are free to go to your mosques or to any other place of worship in this State of Pakistan. You may belong to any religion or caste or creed that has nothing to do with the business of the State.” Pakistan originally reserved 5 percent of higher education, army, and government positions for Christians. But in 1972 Islam was made the state religion, the quota system was laid aside, and many Christian schools were nationalized. In 1991 Sharia (the strict interpretation of Islamic law) was made Pakistan’s supreme law. Pakistan’s blasphemy code—in existence since 1860, originally to protect all religions from each other—narrowed to focus on blasphemy against Mohammad and the Qu’ran. As of 2014 at least 16 people were on death row in Pakistan for blasphemy, with 20 more serving life sentences. Along with a rise in militancy and fanaticism in the early 2000s, this left many Pakistani Christians disillusioned, socially and economically marginalized, and unsure of their safety . In 2013 the suicide bombing at All Saints Church in the northwestern city of Peshawar, the worst attack on a church in the history of Pakistan, claimed the lives of 85 worshipers. Television footage by Pakistani and international media showed outraged Pakistani Christians across the country. That year the Pakistani government opened negotiations with domestic militants called the Tehrik-e-Taliban or Pakistani Taliban designed to end years of fighting that cost thousands of lives and forced hundreds of thousands of people to flee their homes. The government hoped the negotiations would stop atrocities, but in view of the Taliban’s insistence that Sharia law be imposed in the country, analysts were not optimistic. 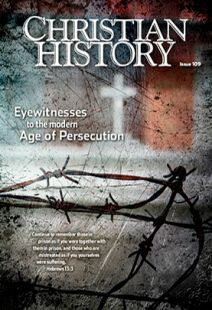 Pakistan was not the only place where Christians and Muslims clashed in the twenty-first century. Ongoing political violence in Egypt led to extensive attacks on the Coptic Christian minority. Copts have lived and worshiped in Egypt since Christianity’s earliest days (see “Hard pressed but not crushed,” pp. 44–46). They suffered persecution first under the Roman Empire and later, after the Council of Chalcedon (451), at the hands of other Christians who rejected the Copts’ definition of how Jesus’ humanity and divinity related. Arab invasions in the 600s reduced their numbers greatly, but the church never died out and in fact experienced a revival in the twentieth century. Like Egypt, Syria knew Christianity since its early days, when the common ancestors of the Greek Orthodox Church, the Assyrian Church of the East, and other Orthodox groups began worshiping there. Syria also has a sizable number of Eastern Catholics (who worship in Syriac but are under the pope’s authority), and missionaries introduced Roman Catholicism and Protestantism as well. Syria has never had a state religion, but in the early 2000s it became a center for recruitment of mujahedeen (holy warriors) from several Muslim countries. They branded Syrian Christians as kuffars (infidels) and “Assad’s stooges” (lackeys of Syria’s president). Churches in Syria were attacked, nuns and bishops kidnapped, and individual Christians forced at gunpoint to convert to Islam. In 2013, 46 people were killed when jihadists seized the Christian village of Sadad. Several were tortured to death; Sadad’s 14 churches, some ancient, were ransacked and destroyed; and the bodies of six people from one Christian family, ages 16 to 90, were found at the bottom of a well. Christians in Iran too trace their ancestry to the beginning of the church—the “Persians, Parthians, and Medes” who were converted at Pentecost (Acts 2:9). A minority religion for all of the region’s history (first under Zoroastrianism, then under Islam), they were sometimes protected as a minority by authorities, at other times they became the victims of massacres. The Islamic Republic of Iran came into being in 1979 with Islam as its state religion. Authorities closely monitored Christian activities, especially churches that reached out to Muslims. Any Muslim who forsook Islam faced the death penalty. Since the 1990s Iran has from time to time used death squads against converts, including several major Protestant leaders. In 2013 Iran sentenced four Christian men to 80 lashes each for drinking Communion wine. In Pakistan, the Palestinian territories, Turkey, Nigeria, Syria, Somalia, and Kenya, vigilantes have threatened, beaten, and killed converts. In the Central African Republic in 2013, some 450,000 people fled after the Muslim-dominated Seleka alliance took power and began persecuting Christians. Reforms urged in all these nations include reforming madrassahs (Islamic schools) to teach contemporary as well as religious subjects; monitoring charities to see if they represent fronts for militant organizations; and expanding education to keep young and impressionable minds from falling into militants’ hands. Sheraz Khan is a Pakistani British journalist who has written extensively on the persecution of Pakistani Christians. He lives in Scotland with his wife, Linda. He can be contacted at sheraz@btinternet.com.